When Sightron announced their new SVSS series for 2015, I was hoping for good things. Certainly the specs look very promising as is the price point… Yikes. First Sightron to MSRP well over $2000 (Canadian retail $2700). It better be good. 34mm 1pc tube, 41.5oz. 70 mins of elevation. 60 mins of windage. 20 mins per turret revolution. Certainly checking off the right boxes. A big solid, robust scope. The main feature that caught my eye was their patent pending side focus system. Looking similar to fine and coarse focus adjustment on a spotting scope, I hoped that it would offer the shooter a much better and easier way to get image into focus when viewing targets at LR. This it does and does superbly. 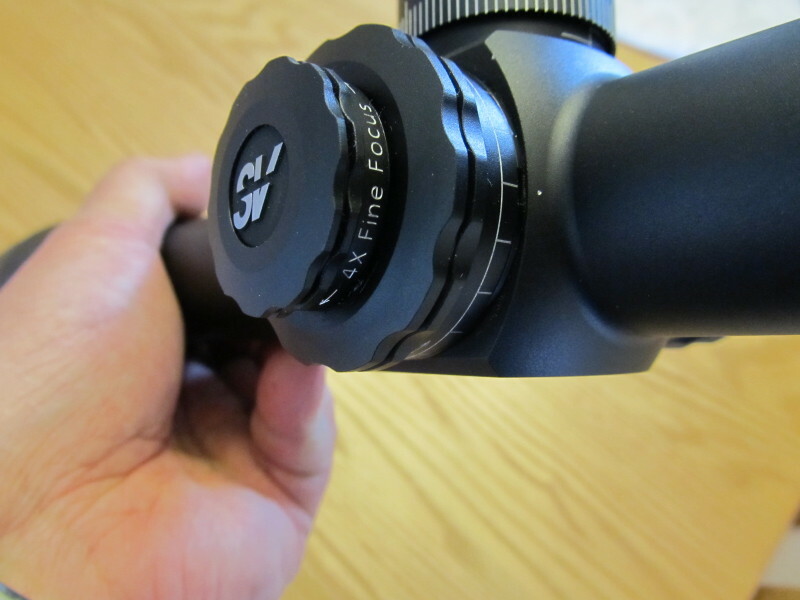 By far, the best side focus system I have ever used on any brand or type of rifle scope. The glass also struck me as being very sharp, crisp and clear. But am I biased or viewing on a good day? 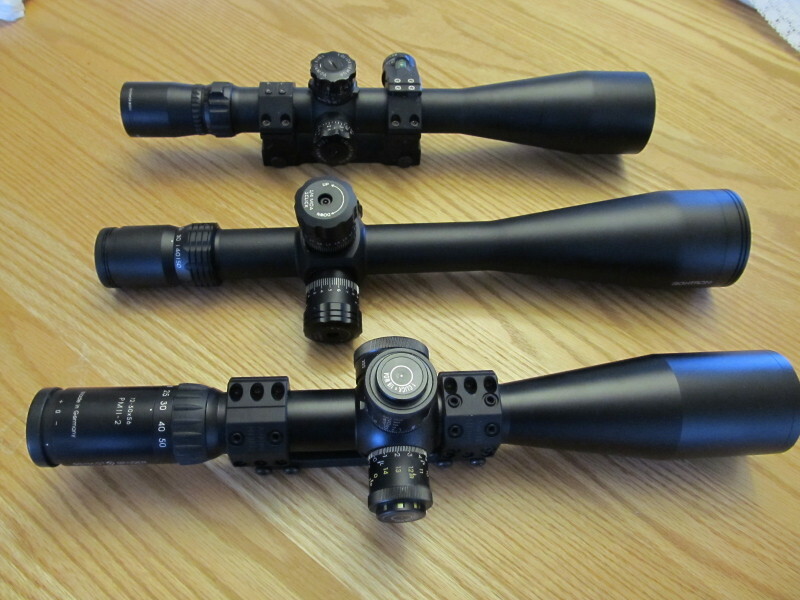 An opportunity was offered to compare the SVSS to a couple of other top tier high mag scopes. I received the S&B 12-15X56 and March 5-55X56 from CGN member ‘blackburbot’ to compare. Schmidt and Bender, and March certainly need no introduction as a top tier optic. 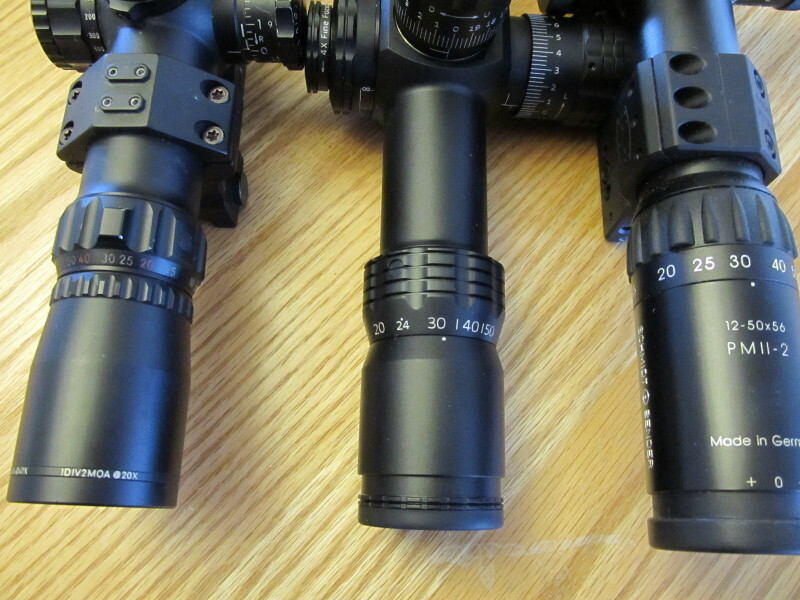 When reviewing the specs of these scopes, you can only see a lot of similarities. All have 34mm tubes, are high mag variable scope with similar range of operation and front AO size, side focus with exposed target turrents. Similar weight between the S&B and SV. The March is 13oz lighter – that’s a lot! In this review, I am not interested in the mechanicals and tracking of the scopes as we know they work. What I am looking at is pure optical qualities over a range of ambient lighting conditions and distances. Let’s start by saying that these scopes are in the “1%” of high mag target scopes. 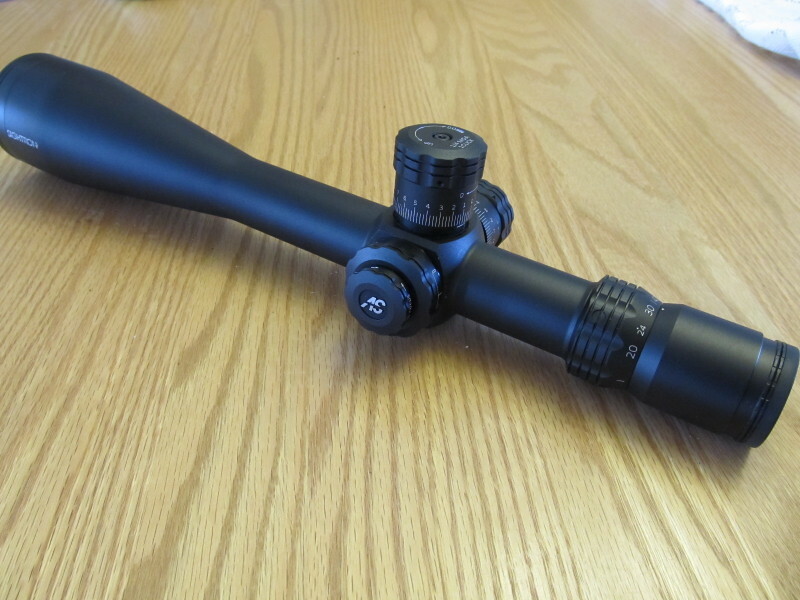 Anything rated as “worst” is still head and shoulders better then consumer grade scopes. This is like comparing exotic cars.. all amazing in their own right but when put together, differences are highlighted that would typically go unnoticed. As an F class competitor, I am most interested in higher mag optics that let you clearly see the target and the air (mirage) to allow the best chances of hitting the center. 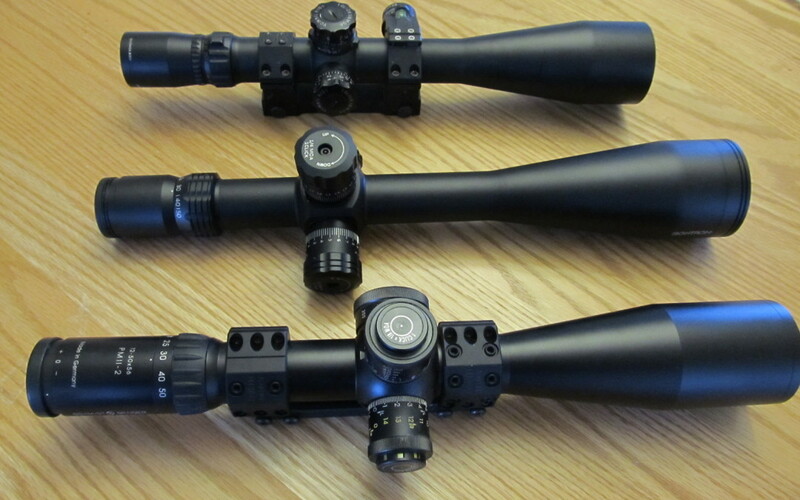 My demands are very high and many will simply call them picky but when investing this type of money ($2700 to 3600+), these scopes better perform at an “exotic” level. 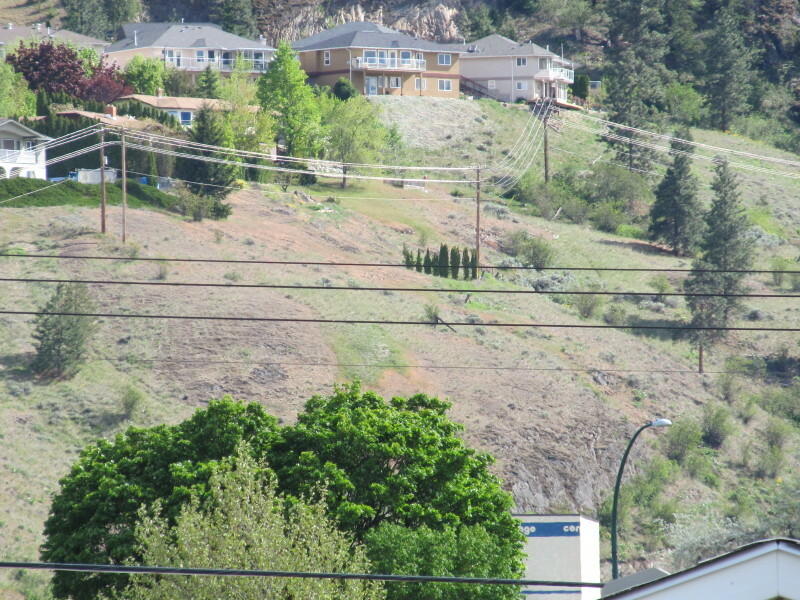 The test scenerio is looking out my 2nd storey window at a hillside (1000 to 1100yds) and parking lot (435yds). I have found that being elevated gets me out of the ground effect distortion. Looking through “cleaner” air. I have separated the test into 3 times of day to test the widest range of ambient light and mirage. It was very surprising how these changes can affect each scopes performance and I will make note of this as we go a long. Time 1 – cloudy in the mid afternoon. Some patchy light changes but pretty much dull. Light winds, cooler, lower mirage. Ideal times to see clarity and resolution. Time 2 – early morning. Sunny, no clouds. Temps heating up. Targets could be shadowed while surroundings in light. Mirage building. Winds light. Time 3 – early afternoon. Bright sunshine, no clouds. Temps in the mid 20’s. Targets well lit. Mid to strong mirage. Moderate gusty winds. This one was very surprising. The S&B has the shortest eye relief by a large margin. Given that this might be mounted on higher recoil rifles, you are getting pretty close to that eyepiece. Not my idea of fun. Both the March and Sightron shared similar long eye relief. Anyone shooting bigger boomers will not get scope eye with these scopes. Despite having a short eye relief, the eye box (image that your eye perceives) on the S&B is HUGE. This is similar to a high end spotting scope type eyepiece. It was very comfy to look through and crisp edge to edge clarity. If no one told me, I would say it was a top tier spotting scope like a Leica or KOWA. Has a quick adjust diopter so getting the reticle in focus is fast and easy. The Sightron eye box was identical to other SIII scopes which is to say very very good. Crisp edge to edge with no curvature. Easy to use and forgiving on eye location. Again, quick adjust diopter similar to the S&B. The MARCH was a bit of a surprise. The eyepiece was very old school in setup. Diopter adjustment used the old style thread and jam nut. Size was also physically small similar to older target scopes with 1” tubes. This was the most critical eye box for position and distance. When you got in the right position, it worked fine but not very forgiving. Not the type of eyepiece I would want in an environment where speed is important. There was a edge distortion and curvature…. uummm????. Like a high end spotting scope, the S&B offered a stellar field of view. I only tested at 32X and 50X cause those are the mags I use most for F class shooting (this is a high mag test after all). You would have no issue seeing several targets wide at 32X. Even at 50X, you never felt claustrophobic. I could see being very comfy looking through this eye piece for long periods of time. The Sightron offered about ¾ the field of view at 32X and 50X. Still really good and wider then most scopes. Most will be blown away by the SV but this S&B is just that much better. The March was the smallest with almost ½ the field of the S&B. You really felt like you were using a small tube scope. At 50X, talk about tunnel vision. You certainly aren’t going to be distracted by neighbouring targets. If you were a birder and had to use a scope, instead of a spotter, I would give you this S&B and you would live happily ever after. The colours were true with very nice contrast. Even at 1000yds, it all looked “right”. The SV and M were really good too but that really depended on the amount and style of light. The SV did better in low dull light vs the M. The M really pepped up in the bright sunshine. The SV colours started to get more “white” the brighter the light got. As I am looking at black and white targets, or rocks/gongs… this really isn’t going to sway a buyer. The S&B is just really good in all the lighting conditions tested. This was definitely the closest test with all similar. But the S&B advantage was obvious as was the lesser performance of the March. The SV sat right in the middle. Now we get to the money sections. The viewing was repeated many times, going round robin between the 3 scopes. Every effort was spent to adjust focus, looking at the target over a period time. As I already said, all are amazing and this review will border on the nit picking but there are differences that could matter depending on your tastes and end uses. The ability to precisely adjust the focus of the image of the SV was so easy, so intuitive and SOOOO much better then the other two. Anyone who has used a S&B or March is going to say “what’s the problem?”. There isn’t one per se… they both work. It is just that the SV is head and shoulders BETTER. It is like using 1/8 min clicks vs ½ min clicks. The SV was the 1/8 min… the other 2 like ½ min. Yes, both could be focused eventually to hit the mark but a small nudge and you could be off. With the SV, it was a no brainer. This is now my favorite system to get far away targets in focus. Pretty tough crowd when a March is ranked 3rd. Target were a license plate at 435yds, a chimney at 1000yds and a rotted post with straw grass at 1035 yds. In Time 1, the SV was simply superior to the other two. It was obvious and repeatable. On the chimney, you would resolve the entire grid line that makes up the chimney. The grout lines stood out even with the varied colours of the bricks. Reading the license plate was crystal clear and dead easy. You could see the cracks and lines in the post and resolve each strand of straw grass. This is resolving stuff that some scopes can’t do at 300yds, let alone over 1000yds. The March had a harder time seeing the grid line in this lower light condition. The license plate was clear. Again, lost detail on the post and grass. Not the scope I would use in lower light environment if highest LR resolution is desired. Why the change in results? As I stated earlier, ambient conditions have a dramatic affect on optics and as the light and mirage changed, so did the results. The S&B excels in these conditions seeing “through” this mirage to allow more clarity on target. The amount of the chimney grid was similar vs the no mirage/low light (Time 1). License plate was clear even when the mirage waves rippled through. More details of the post and grass were possible. The March improved a bit in this lighting. It was easier to see the license plate when the waves of mirage came through vs the SV BUT the amount of the grid line on the chimney really didn’t change. I have always stated one of the main reasons I compete with the Sightron SIIIs is their ability to see mirage sooner and better. The SV is no different. It picks up the mirage sooner then the other two and that distorts the image resolution at distance. I really like this. It is at the cost of distorting the resolution so all the chimney info would change depending on the depth and intensity of the mirage. The grout lines would go from clear to muddy as the waves passed. No problem with aiming on the grout line but the image would change far more then the S&B. Now that is not exactly a negative as that change in image is due to wind and this is easy to pick up in the SV. Maybe it will help me clue into a subtle wind change? Could read the mirage off the top of the chimney and roof easily with the SV.. best of the 3 in this light. As the light got brighter, the March started to come alive. Looking at the license plate at 435yds, in the bright sunlight, the numbers were clear and easy to read even with the increased mirage. The March also lets you see through mirage very well BUT only in bright sunlight. The SB and SV both lost clarity depending on the intensity of the mirage. When thing got pretty thick, there were times when you couldn’t read the numbers clear enough to say for sure it wasn’t another letter. Still could see and aim but clarity was tough. In this air, the March continued to let you read the license plate clearly. I now understand why these have been the darling of SR BR shooters. It excels in the lighting conditions this sport typically undergoes. Yep, there is that weird change again. After such a strong showing on the license plate, the March fell short on the Chimney… It just didn’t have the glass to get things done at LR. Still better then the vast majority of scopes out there but this is a tough crowd. The ability for the S&B to see through the mirage really helped here and the Chimney grid line was definitely better vs the SV. The SV was no slouch but seeing the mirage has its costs. 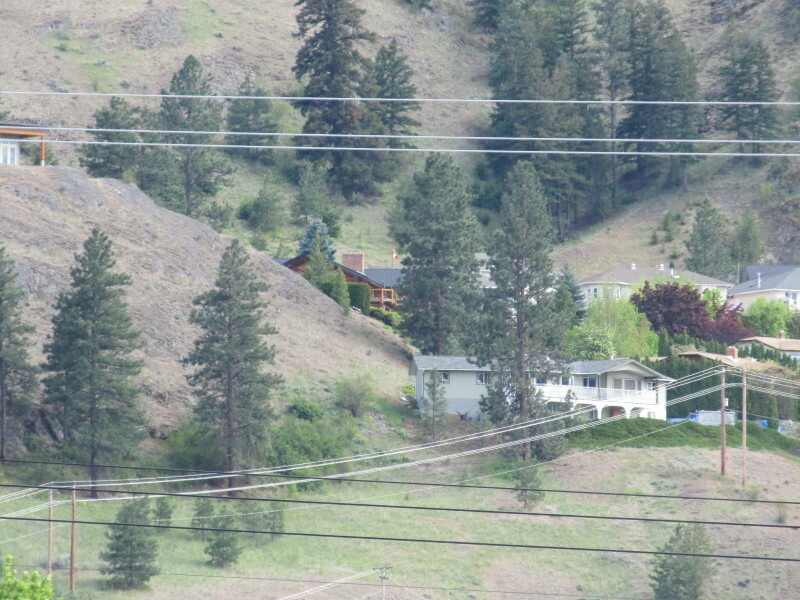 I am not saying the image with the S&B was clear… it just offered more useable info on the grout lines of the chimney. Very precise aiming at LR in heavy mirage is simply easier with this scope. So if the goal was to see mirage at any distance in as wide a range of conditions as possible, the winner here would be the SV. If you prefer to see fine detail regardless of air, go S&B. Hopefully, your shooting partner is good at reading the mirage cause you will see less of it. And that might be a bad thing with a subtle wind shift. The big surprise is how good the SV resolution is in clean air. This is a game changer for Sightron. I knew it was resolving very well but doing side by side with these top tier scopes really showed how well it performs. That SV focus system is really key. The other scopes are just so hard to make small adjustments and small adjustments have big effects on the image focus at LR. I wondered who the potential market for the SV might be. Now I know. Anyone that sees the S&B 12-50X56, and older NF NSX as a viable scope, is going to LOVE the Sightron SV. That includes F open, FTR (if not too close to max weight), and LR/ELR shooters. The winner? Well, they are all wonderful optics and anyone who chooses any of these will have a very positive experience BUT…. I would warn any MARCH purchaser to look through them and see if the eye box is acceptable (other scopes may use a different eye piece?). 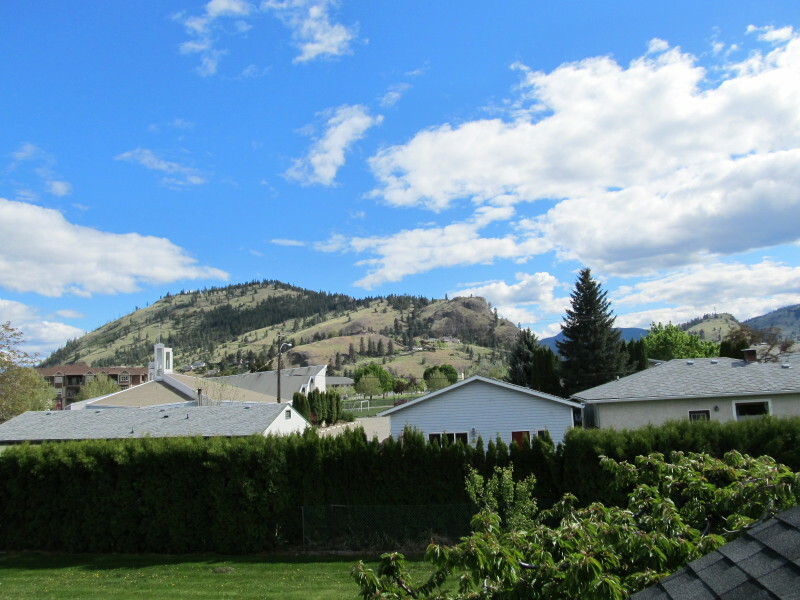 For SR BR, mid range BR in the summer (bright light), awesome. For a PRS/tactical rifle, not so much. The turret markings are big bold easy to see. Mag markings, tiny. 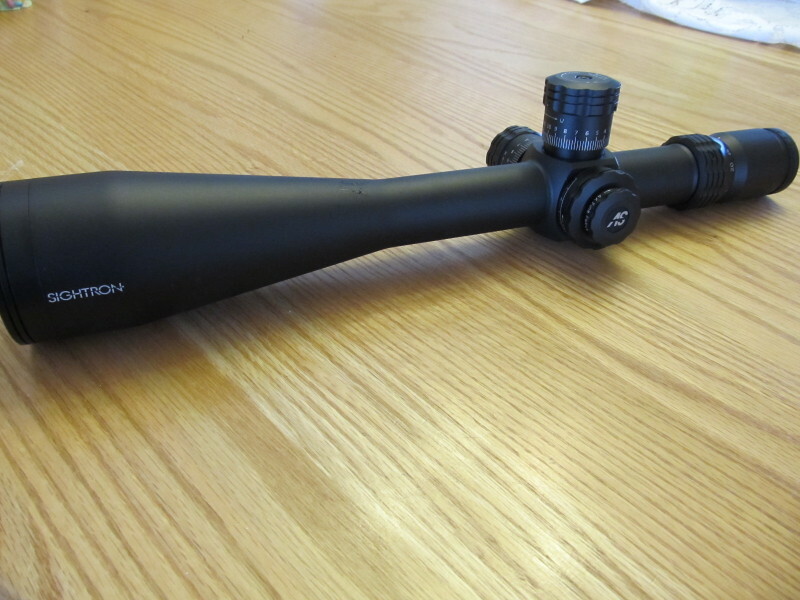 The S&B continues to be my fave glass of the scopes I have tested so far (Tangent Theta, high end Euro tactical scopes are on my list to try someday). 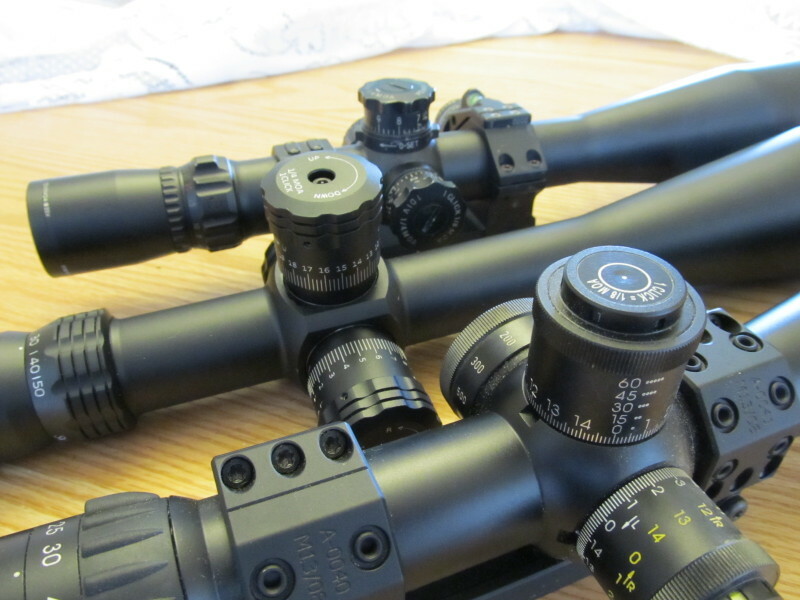 This scope reaffirms how warm, and clear a scope can be. It will put the boots to a whole lot of big objective spotting scopes. BUT… the eye relief is really short. For my application, that is a no go. I am surprised that S&B hasn’t changed this and if they did, this scope would be very hard to beat (except if you need a light optic). The side focus is also touchy and the distances markings are so far off, they would be best to not even be there…. my best focus has the dial around 600m even through I was looking out to 1100yds. The March was way closer. The knobs also rotate the “wrong” way… no biggie? Not unless you turn them the “right” way. With so many years of competition turning knobs the Japanese/US way, I cannot take a risk with reverse rotation knobs. That leaves the Sightron SVSS 10-50X60 and as an F class shooter, this is my winner. Why? That focus. OMG, it is amazing to use. I have the ability to change focus in very small amounts to really sharpen the image over a wider range of light. Or pull it back to any distance I want to see the air. It really will be helpful on larger venues where air can vary from distance to distance. The SV would have been a joy on ranges like Raton, NM and Phoenix, AZ. The glass… not as colour perfect and warm/rich as the S&B but the resolution is simply the best of this bunch in no mirage air at LR. WOW, that is saying a whole lot. Picking up mirage early and then seeing mirage over a wider range of light is a priority to me. The Sightrons continue to be my fave for this task. Long eye relief and wide eye box is just so much easier to use and allows me to reduce eye strain. Relays can go 45mins… you are staring at a target a very long time. In string fire, the chances of getting tapped on the brow is zero. Easy and quick to adjust reticle focus. Some days, you just need a quick tweak to get things right (aging eyes). 20 mins per revolution of the elevation turret. That is nice as I can cover all the distances I compete in 1 rev. It wouldn’t be a deciding factor in choosing this scope but since it’s there… it will be helpful. Price. The SV is approaching $1000 less then the other scopes. That is great value for sure. Warranty is also lifetime not limited as with S&B and March. Downsides – Weight. This is a heavy scope. If you can make weight with the S&B or NF NXS, the SV is similar BUT for many, this is simply too much weight. If Sightron could have built the SV similar in weight to the NF comp and March, this would be a very interesting year indeed. For those shooting boomers and don’t care what things weigh, I would strongly recommend a look at the SV. The further you shoot, the better this optical system will get.